Last year's Free Press Sports Person of the Year, James Cowton, with guest speaker Richard Cresswell and sponsor Chris West. 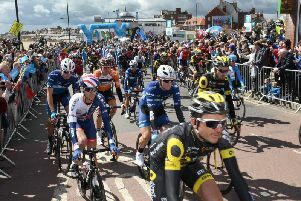 Whose achievements have topped the rest in Bridlington this year? Which team deserves recognition for its success in 2014? Who has worked behind the scenes to make a difference to the sporting community in Bridlington? If you know someone who fits the bill, entries are open now for the fourth Bridlington Free Press Sports Awards. In addition, honours will be given out for Outstanding Contribution To The Community Through Sport and a Special Award, with the winners chosen in conjunction with Bridlington Town Council and East Riding of Yorkshire Council. Further categories may be added if extra sponsors come forward in the near future. As always, the judges will make their decisions on the quality of the nominations received, not on the number of votes for a team or individual. The awards ceremony will take place at Bridlington Rugby Club on Friday March 6. To make a nomination, email sport@bridlingtonfreepress.co.uk, including who you would like to put forward, for which category, and most importantly, why they deserve an award. Remember to add your name and contact details. Sports editor John Edwards said: “Don’t be modest. If you, or someone you know, has achieved something memorable this year, let us know. “And don’t think we are only interested in mainstream sports. Previous ceremonies have proved that smaller, minority sports have just as much of a chance of winning. “The Club of the Year award is all about rewarding clubs who have got involved with the community, as much as getting great results on the pitch. “And we want to hear about committee members, referees, league secretaries or anyone else who goes the extra mile to allow others to enjoy sport for our Unsung Hero award. This is the fourth year the Free Press has organised the awards, and last year saw motorcycling’s James Cowton win the main award. Previously, triathlete Ryan Hepworth and darts player Steve Rice have been names Bridlington’s Sports Person of the Year. The event’s main sponsor is again West BS. Categories have been sponsored by Lloyd Dowson, East Riding College, Flamborough Head Golf Club, Bryan Brown, Pineapple Joe’s, Specsavers, Bridlington Round Table, Bridlington Rotary Club and Bridlington Dental Studio.